We’re finishing off the year with birds! We think a Fall Bird Walk in November and the Christmas Bird Count in December are a great way to conclude our 2012 Birding Big Year for Glen Providence Park. We have identified a total of 97 bird species so far for our Park Bird List, 79 during our 2012 Big Year. Those numbers would be even higher if we were more skilled at identifying warblers, little brown birds, and bird calls- so we’re calling in the experts! This bird walk will be led by cousins Nick Crocetto and Nick Pulcinella of the Birding Club of Delaware County. Nick Pulcinella has been an active birder since early childhood, and travels around the country and the world for birding. He has been a compiler of the Delaware County Christmas Bird Count (CBC)- in fact Nick and Nick have been participating in the CBC for over 80 combined years! Nick Pulcinella also served on the Pennsylvania Ornithological Records Committee, and has published books about local birds. Whether you are a novice or experienced birder, come explore the park with us, and help us increase our numbers for our Birding Big Year! Please note the location– we are starting at the Upper Providence entrance at Third Street and Kirk Lane! 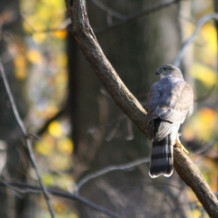 Photo is a Sharp-shinned Hawk on the Shingle Mill Trail in November 2011.